Investors appear to have gotten bored of hating online grocer Ocado, and are buying its stock again. OCDO.L has risen 45% from a low of around 220p in mid October to 320p today. It’s up over 4% today alone. Analysts concluded that its shopping technology was not proprietary to Ocado, as previously assumed. They didn’t like the fact that Ocado’s agreement to deliver Waitrose products was coming to an end in 2017. Ocado makes minimal profits, and analysts tend to want to see earnings per share. Since then, however, a couple of things have happened to make people think again. First, the entire traditional structure of the UK supermarket business went into full-scale collapse. Sainsbury’s Asda, Tesco and Morrison’s have all posted revenue declines. Discounters Aldi and Lidl have benefited. Second, Ocado posted 22.5% growth in revenues in its Q3, to £232 million. While Ocado’s revenues are still a small share of the UK’s overall market, they still demonstrate something than analysts appear to have written off: That Ocado’s business is growing while the majors’ are in decline. There are a couple of other things happening here too. 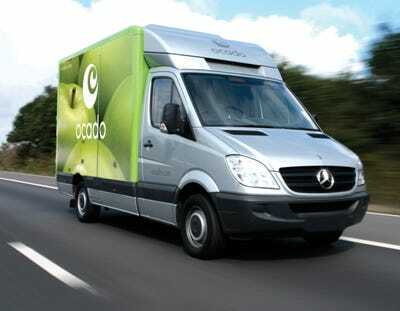 Ocado is the leading specialist in online grocery delivery. Other supermarkets also do online delivery, but Ocado is the expert. Ocado is the Amazon to Tesco’s Waterstones. Which company is going to grow more, Amazon or Waterstones? Tesco or Ocado? And slowly, very slowly, the analyst community is starting to realise that tech company income statements are different from supermarket income statements. Ocado’s revenues are growing robustly, but why can’t it make a profit? Because it is spending those revenues on expanding its footprint and scaling up its business. Look at its expenditures: The money is basically going on new trucks and sites. It’s a lot like Amazon, in other words: It doesn’t want to make a profit right now because it is more useful to take market share, add customers, and whittle away at Sainsbury’s, Tesco and Asda. One last thing: This notion that Ocado is a middle class thing, which makes it vulnerable to the cheaper prices of Lidl or Aldi. Imagine you’re on £10 an hour. You can spend two hours doing your weekly shop at Aldi, or you can spend 10 minutes on Ocado’s app getting your shopping delivered right into your kitchen by a nice man who calls you “sir.” Yes, it might cost you a bit extra, but you can also put in two more hours at work (maybe at time and a half) and you’ll probably come out ahead. Don’t bet on The City’s analysts figuring that level of working class maths into their Ocado models any time soon.